In the spirit of the holiday season, some Amateur Radio (ham) operators across the country have found a way to bring joy to hospitalized children. Thanks to the world-wide range of Amateur Radio equipment, it's possible for hams to communicate with other hams almost anywhere on earth, including the North Pole. Fortunately, Santa Claus is able to take time from his busy gift production duties to speak individually to the hospitalized kids. In southern California, members of the Hospital Disaster Support Communications System (HDSCS) annually took their portable ham sets to Childrens Hospital of Orange County (CHOC). Using the North Pole Network (NPN), which purports to use a special amateur satellite link, ionospheric propagation and VHF relays, kids could talk one-on-one to St. Nick without having to leave their hospital rooms. The globe-spanning NPN link meant that HDSCS didn't have to rely on ordinary Santa-helpers who could only ask, "What is your name and what do you want for Christmas?" As one patient put it, we talked directly to "the Man, the real one!" During NPN contacts, Santa was in his North Pole office where he had access to his mega-computer system. Thanks to the computer and lots of advance "elf" work by hospital staff, Santa already knew which patient was in each hospital room and he had a lot of information already stored about each child and family. The NPN connection gave Santa a chance to make final updates to his gift request database before loading his sleigh on Christmas Eve. It also afforded him a chance to send greetings and wishes for happiness and a return to good health. The founder and leader of the Orange County's North Pole Network was April Moell WA6OPS. In addition to CHOC, NPN occasionally visited other Orange County medical facilities, including rehabilitation centers for both adults and children. On December 16, seven HDSCS communicators responded to Children's Hospital of Orange County in the city of Orange to set up a link to the North Pole station so that patients and family members could have a direct, personal contact with Santa Claus. Despite strong winds at the North Pole, radio propagation was excellent and signals held up well for the over seven-hour North Pole Network event. About fifty "I Talked To Santa on Amateur Radio" buttons were given to patients, siblings, parents and some medical staff members. They earned the buttons by talking to Santa on the radio. Every year, these buttons are received and worn with pride. Santa has great elves who do a superb job of collecting advance information on the patients and their families. As patients and their families speak with Santa on the radio from his workshop, there is no doubt that they are talking with the real one. After all, when it's Santa that introduces the patient to the communicator, knows about family members, and confirms that the elves are working on the present that had been requested before by e-mail, how could one not believe? Via these contacts, the Big Guy got advance notice about what he might find as his sleigh flew into Orange County on Christmas Eve. Chocolate chip cookies topped the list, but some patients declared that oatmeal and sugar cookies, and maybe even pizza might be waiting. 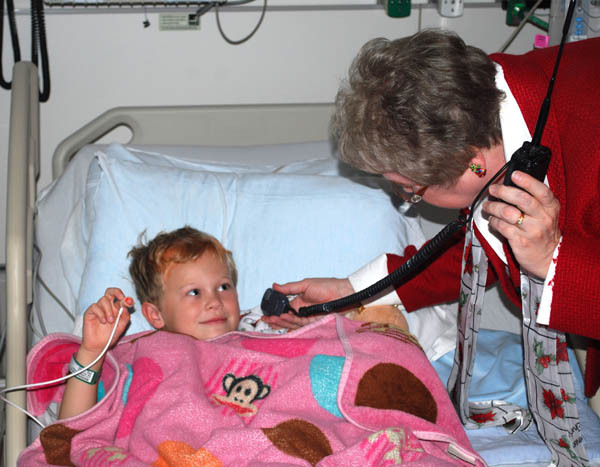 For St. Nick, the best part was the many patients who wanted to tell him, "I love you, Santa!" Our medical background and our regular disaster communications service to the hospitals have given CHOC staff members confidence in us. 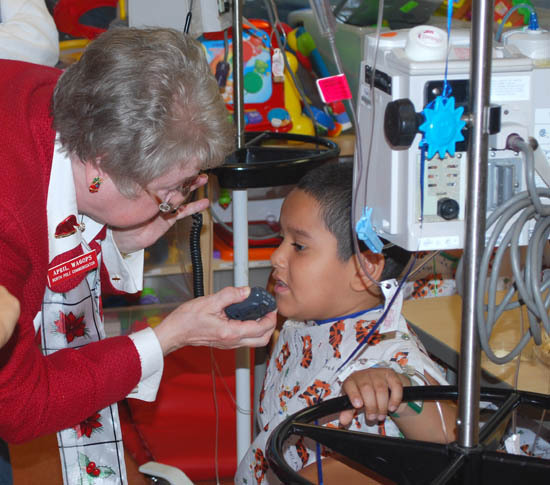 That makes it possible for us to take Santa's voice to the sickest patients. We went in and out of isolation rooms (gowning, gloving and scrubbing as needed) and went from bed to bed in Intensive Care units. That is what Santa wants most -- to talk with the patients who are most likely to be confined to the hospital through Christmas Day and to those whose medical conditions limit their ability to enjoy the holidays. The reactions of family members let us know how important Santa's words were to their children and to them. The personal touch meant a great deal to parents. Many thanks to Samantha, Amber and Emily of the Child Life staff at CHOC for making our visit possible. The technical crew included Tom Gaccione WB2LRH, Jim McLaughlin AB6UF, Ken Simpson W6KOS and Woody Woodward W6PA. Joe Moell KØOV was Technical Coordinator. Lead Communicator and overall North Pole Network Coordinator was April Moell WA6OPS. "Join the North Pole Network," originally published in 73 Amateur Radio Today Magazine. "Bringing Santa to Kids via Ham Radio---12 Ways to Make It Better," originally published on the ARRL Web site. North Pole Network Photo Album shows what happens in a typical patient room. NPN Through the Years has over two dozen classic photos. Our North Pole Network has been featured in the Group W Television production "There Really Is a Santa Claus" as well as a news story on KTTV Channel 11 in Los Angeles. There have been articles about NPN in several publications including NurseZone, a Web site for the nursing profession. Text and images on this page ©Joseph D. Moell. Republication of any content in this site without permission is prohibited. This North Pole Network Web site exists to encourage Amateur Radio groups all over the country and the world to sponsor their own local North Pole Network events. We are always pleased to hear from other groups.